As you may or may not know, I’m a breakfast gal. I could eat breakfast all day everyday. Omelets make me swoon, hashbrowns throw me into a frenzy, and don’t even get me started on a good stack of banana pancakes. Since I now spend almost every weekend in the city, it has become a tradition to spend Sunday mornings after church with friends getting brunch. A little story: brunch used to be one of my biggest pet peeves. Yes, right up there with loud chewers and heavy breathers, was brunch. Why would I want to put two meals into one? Doesn’t that mean less food, less time to eat, less of an experience? Then I turned 20 and realized I’m a suburban white girl: loving brunch is in my blood. Brunch is an experience. You eat slower, sip on never ending cups of coffee, and don’t have to rush off to the next thing because guess what, you’re at brunch. Everything that’s important is happening all around you and the people who matter that day are eating brunch with you. Love it. This past Sunday I was fortunate enough to grab a table at Yolk, one of the most well-known breakfast/brunch spots in Chicago. Yeah, the wait was pretty long! I sat out in the sun waiting for Megan to arrive from Lakeview. I had to wait about 45 minutes which really wasn’t bad considering the amount of people both inside and outside the restaurant. That place is really good at moving tables and getting people in. Megan arrived just in time for us to be seated (which is good because Yolk doesn’t seat incomplete parties). I had requested to sit outside, and it ended up being totally worth the wait. 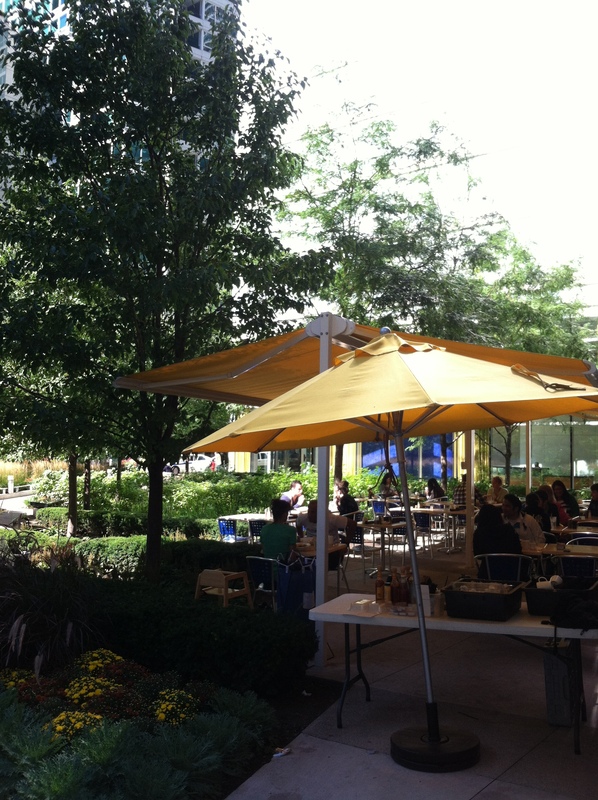 Being in the loop downtown means that you spend 75% of your time in the shade, which isn’t a bad deal! We got to experience the nice weather (70s) but not have the sun beating down our backs. It was a gorgeous afternoon. Bacon and egg quesadilla: Hickory smoked bacon, scrambled eggs, and green onions ROLLED in a white flatbread with cheddar and jack cheeses. Served with salsa, sour cream, and red diced potatoes or fresh fruit. Margherita frittata: tomatoes, fresh basil, and garlic scrambled with red diced potatoes. topped with fresh mozzarella and baked. Served with a side of marinara sauce. Banana-blue crunch cakes: Our multigrain batter loaded with granola and fresh blueberries…topped with bananas and drizzled with honey. Banana’s Foster crepes: Our crepes stuffed with bananas sautéed in butter, Crème de Banana, and brown sugar. topped with whipped cream and pecans. Tour de France French Toast: A sample of our 3 special breads, french toasted. Banana Nut topped with bananas, Sweet Orange topped with strawberries, and lemon Poppy Seed topped with blueberries. The choices were nuts. Of course I got overwhelmed and just went with a classic omelet, served with whole wheat bread and potatoes. Everything was perfect. The only complaint that I have is that there is no way that was whole wheat bread. Whole grain, definitely, but not whole wheat. Silly waitress you can’t fool me. My omelet was filled with cheddar cheese, onions, green peppers, and tomatoes. The omelet was so so so great. I wish I could add another “so” to that description but excessiveness like that might seem like I’m exaggerating. I am not. I didn’t even need to use ketchup! Not once! That’s when you know the eggs/potatoes are good. I ate almost the whole plate, and even the leftovers were eaten three hours later. Megan was really happy with her scrambler too (it had pesto, potatoes, and over-easy eggs). We enjoyed our time there for almost two hours, sipping on coffee mugs that were constantly being refilled (even if you didn’t want it to be haha). 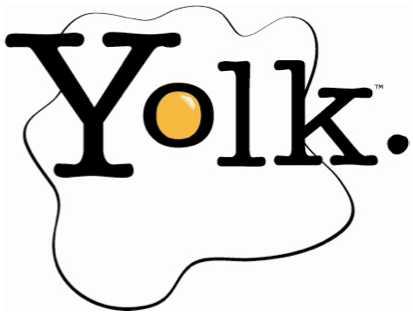 A few small complaints about Yolk: the food is worth any trivial errors, but it’s worth mentioning the bad as well as the good. The service was definitely lacking. From the second we sat down Megan and I felt rushed to no end. It was one of those “No, I’m sorry I don’t know what I want to order yet I sat down 45 seconds ago” situations. Our waitress didn’t smile, tell us her name, or welcome us in any way. To be honest when you’re out with your best friend that’s not the end of the world but as a waitress myself I definitely notice things like that. Also, she kept filling our coffee cups while still practically moving, spilling coffee down the sides of the mug and on the table. Totally unacceptable and really distracting. Luckily it made for funny conversation and Megan and I were able to slow down once we placed our order. I understand busy places like Yolk wanting to turn tables fast in order to get a lot of business, but we definitely weren’t about to rush out of there and not enjoy our time. So once we had our food we ate slowly, sipped on our coffee, and just talked about life for awhile. It was a wonderful time, out there on the patio, and our waitress even seemed to become friendlier as the meal went on. I’ll chalk it up to coming in at a stressful moment for her, but still not an excuse. Overall, I would absolutely come back to Yolk. 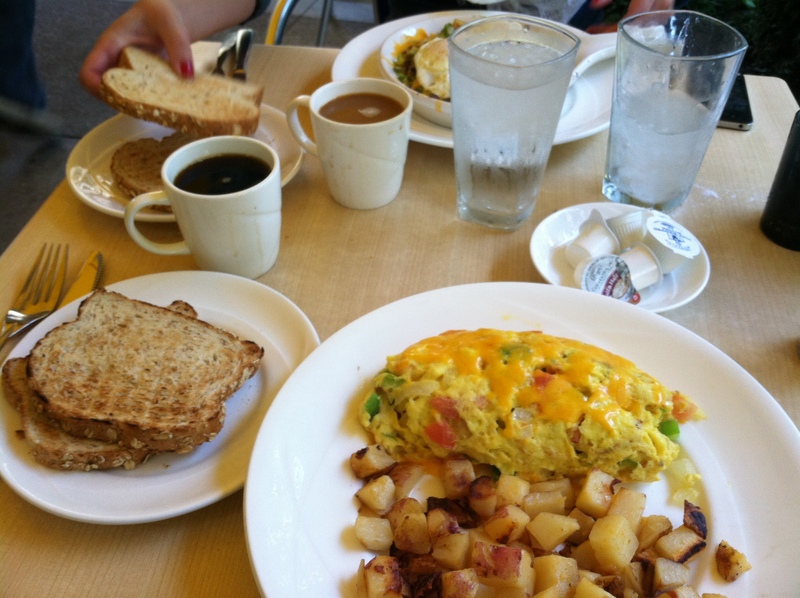 They have three locations in the city which makes it very convenient, and you can’t deny how great the food is: they’ve been featured in multiple Chicago magazines, voted a few times as #1 breakfast in the city, and get praised constantly on Yelp. 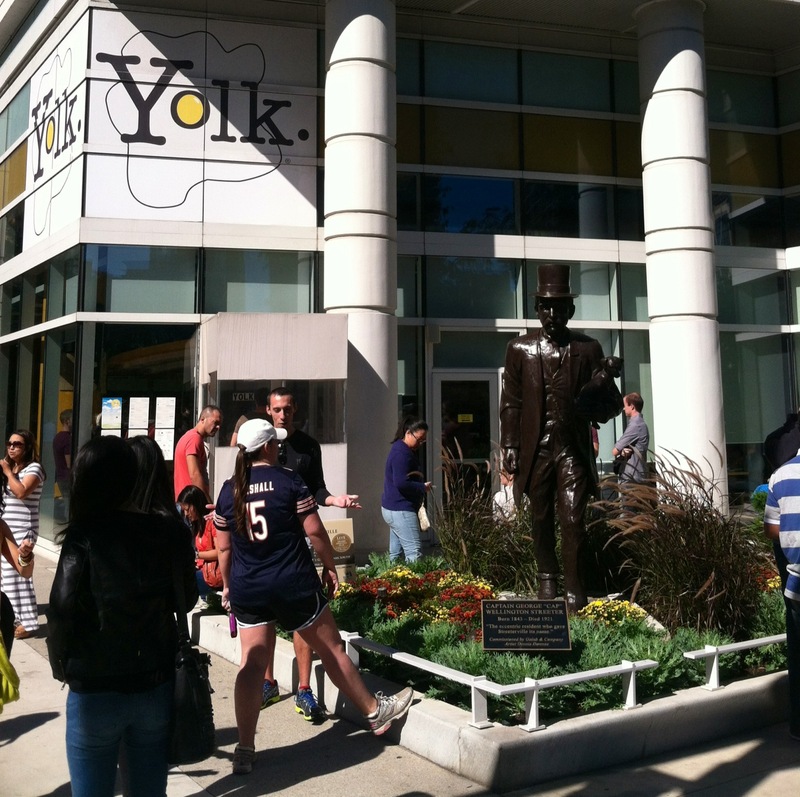 If you have an extra hour to wait one morning and are in the city, definitely make your way to the nearest Yolk. You won’t be disappointed!